I received this cute porch-swing bird feeder for Christmas. I didn't think the birds would use it since I also have quite a few Wild Birds Unlimited super feeders. I hung it on a hook right under my lattice porch roof. 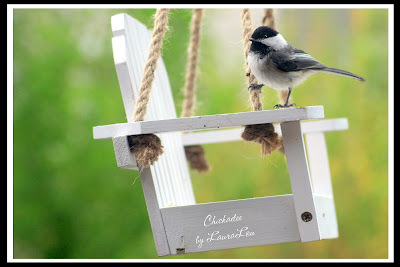 Soon a pair of Chickadees were swooping in and out on a regular basis. I was thrilled. I think they have a nest in one of the big evergreens in my yard. Once I put out the special Oriole feeder, I discovered my pair from last year has blossomed into THREE pair. Do you think she can read? We HAD to come home to Michigan on May 1 for two very good reasons. First, we had our granddaughter with us for the week after Easter. Her parents had to go back to work and her sister, back to school...only she had that week off. However, she had to be home on Sunday for school the next day and First Communion the following week. We had a great time with her all to ourselves. She swam, swam, swam and even learned how to dive! What a water bird! The most fun for me was the photo-walks she and I took. The day her folks left she and I went for a walk on a couple of great piers along the Indian River. Nice shot of the remains of a large sea-turtle, picked clean. She is such a "lizzy" fan and she liked this bright green one. One evening, down by the lake with a few neighbors, we saw strange clouds. Everywhere we looked the clouds were different, dark, oddly shaped, and yet it was bright blue overhead. Every kind of cloud I had ever studied was there and more I had never seen, changing so swiftly we couldn't keep track. We also took pictures of each other taking pictures. Later that evening we heard that one of the nearest towns had experienced a tornado. We knew it was an unsettled sky but didn't realize how dangerous it was. The day before we headed for home, she did a fantastic job of loading the back of the truck. I was packing inside and putting things by the door, Grandpa took them out to the truck and she was inside the "bed" arranging them like a pro. We were done in no time and ready to hit the pool in the 91 degree heat. On the trip home we stopped at welcome centers for several states and gathered some maps. She became quite good at following our progress. The horse farms, mountains and a tunnel were all part of her grand adventure, and ours through her eyes. Besides following maps, she worked puzzles in some nice books her mother had bought for her, took photos out the windows, read on her Kindle and mine, made little movies, and slept a lot. We stayed overnight in a motel, another adventure for her, and were home in record time. "Um...well...I need to go to Melbourne and get my unrepaired lens back from the camera shop." "Ok, then we can go to Cocoa Beach as long as we will be half-way there. I have to get a pump from Dad." "Grab your camera and let's take the little car." (From Wikipedia)The Indian River is a waterway in Florida, a part of the Indian River Lagoon system which forms the Atlantic Intracoastal Waterway. It extends from the border between Brevard and Volusia Counties southward along the western shore of Merritt Island, picking up the Banana River on the island's south side, then continuing southward to St. Lucie Inlet. It was originally named Rio de Ais after the Ais Indian tribe, who lived along the east coast of Florida. It is broad, shallow, and 153 mi (246 km) long. It is an estuarine system where freshwater meets salt water within the same body of water.